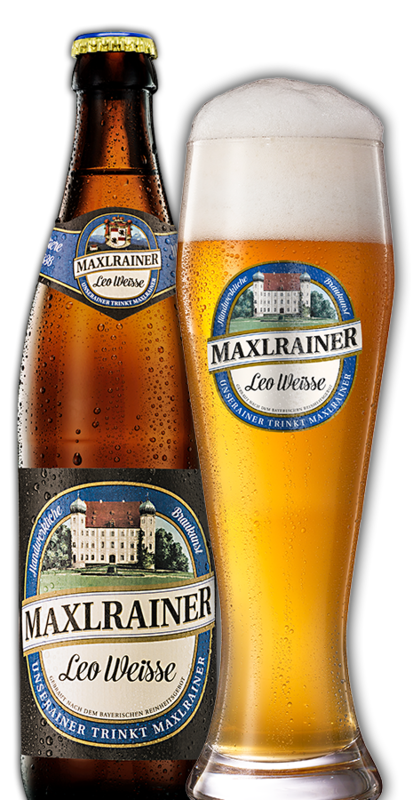 Maxlrainer LEO WEISSE is the appellation distinguishing our classic pale wheat beer. This is the ultimate in fruity wheat beer taste and has continued to qualify for the DLG GOLD Award year in, year out. LEO WEISSE with its full round taste and own inimitable character reigns supreme in Bavarian wheat beer realms, the real secret behind it lying in the brewery’s distinct method of producing top-fermented yeast. Even as the beer is being drawn, the gourmet senses the wonderful aroma it develops. Left to mature in the storage cellars, LEO WEISSE is bottled in its cloudy, unfiltered state, thus keeping the malt and yeast constituents fine and nourishing. Like SCHLOSS GOLD, the Maxlrain LEO WEISSE, a DLG gold award-winning brew for years on end, is also available in smart 0.33l bottles.